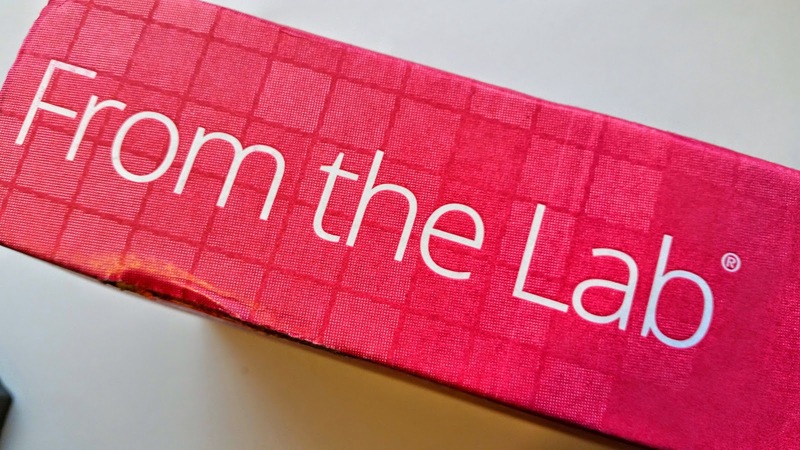 From the Lab September 2014 Review and International Giveaway! From the Lab is a very unique subscription box. It is also one of my favorites. If you are looking for high quality, safe and good-for-you beauty products, From the Lab has got you covered. One of the reasons From the Lab is so wonderful is that every product they send is free of phlalates, parabens, sodium laurel sulfates, mineral oils and they never, ever use products tested on animals OR that contain any substance of animal origin. So you can use any of their products completely guilt and worry free! What you Get: One to three full size luxury beauty products delivered to your door each month. These products are estimated to be worth at least $100 on the retail market but you will get them before they are even available for purchase anywhere else. This month there was officially only one product included but they sent a bonus as well! Who doesn't love a bonus? Even better, the bonus is one of my favorite products ever ever. From The Lab Nourishing Hydration Balm No. 624- This is an amazing product. It is multi-purpose! It has a truly silky and rich texture and can be used as a cleanser, overnight mask, body balm or even a hair conditioning treatment! The key ingredient is Raspberry Stem Cell Extract. From the Lab always keeps up on the latest technologies and snags the best performing products for us to use before Estee Lauder or some other company snaps up the recipe and sells it for twenty times more at retail. This has a special emulsifier technology that creates an ultra-hydrating formula that not only fills in fine lines and rejuvenates damaged skin but also strengthens your hair and gets your skin clean! Raspberry Stem Cells have shown that they help your skin retain moisture and stimulate the production of hyaluronic acid. Certain key proteins also show enhanced ability to accelerated the restoration of damaged skin. This sounds like the miracle product I need! It also contains Murumuru butter which helps protect the surface of your skin, Vitamin E as an antioxidant to reduce free radicals and protect against environmental damage and Evening Primrose Oil to fight redness and inflammation. This is one of the things I love about From the Lab. I get to try this! Normally, I wouldn't even know this product existed and if I did, it would likely be in a price range that would make me unwilling to try it. But now, here it is in my hot little hand and I'm excited to see if it actually does what it says! Eyelift Primer No. 328- This is one of my favorite products I've ever received in my From the Lab boxes. I love it so much that I've purchased it directly from their store because I didn't want to run out. This is, hands down, the best eyelid primer I've ever used. It's a creamy formula and spreads nicely and evenly on your eyelids. Once it's dry (2 seconds), it makes applying eyeshadow an absolute breeze. My shadow application is pure perfection these days. The best part? My shadow looks like it's just been applied all day long. And all night long. And all the next day long. It's amazing. Yes, I actually slept in my eyeshadow to find all this out. It is unreal. You can wear this alone, too, if you like a shimmery look. It also minimizes the appearance of fine lines and wrinkles. For me, it makes me look more awake, too. They don't call it Eyelift for nothing. It also contains antioxidants to protect the delicate skin of your eyelids. It's great for all skin tones and has a beautiful, subtle finish all on it's own. From the Lab does not mean you are a guinea pig, don't worry. These have all been tested! From the Lab partners with some of the best independent cosmetic labs in the world to procure their most groundbreaking products before prestige beauty brands introduce these same formulas, patents, and ingredients to the retail market. There's no fancy packaging and no fancy branding so we get the good stuff for a great price in our boxes! If you would like to sign up for From the Lab, head to their website and join up! You can cancel anytime AND even more amazing is that if you hate something, you can return it! They'll issue you store credit and you can buy whatever you want with it! Not very many subscription box companies do that. The customer service is phenomenal! Here's where your lucky day comes in! I am giving away this From the Lab Eyelift Primer!! Yes, you can own this glorious piece of makeup majesty! I already have two so I don't need a third (yet). This giveaway is open INTERNATIONALLY! So here's your chance to get a little piece of From the Lab even if they don't ship to your country. This giveaway is sponsored by me and only me. From the Lab is not responsible for the giveaway or any issues arising from it. Disclaimer: No purchase is necessary to receive this prize. Please follow the rules and enter responsibly and honestly. If you don't follow the rules prepare to be disqualified. Your first entry is free and you are not required to complete any of the other entry options in order to win. The odds of winning are based on the number of entries received. I am not liable and will not provide any recompense if your package gets lost in the mail (although I will be seriously sad if that happens). This offer is void where prohibited by law. By using the Rafflecopter widget to enter, you agree to all their terms of service. The winner must acknowledge their win within 48 hours or another winner will be chosen. I reserve the right to change or adapt these rules without prior notice. Thanks for the giveaway! I'm very intrigued by the sound of this primer, my lids are vexatiously oily & tend to make shadows crease. Mine, too! I think it's why I love this so much. No creasing at all! I love this product SO much! :D Thanks for stopping by!